Rounding out my recent top sewing, I'm sharing today my embroidered Inari Tee. In an effort to make my basics a bit more interesting, I added a cool pocket detail with embroidery. 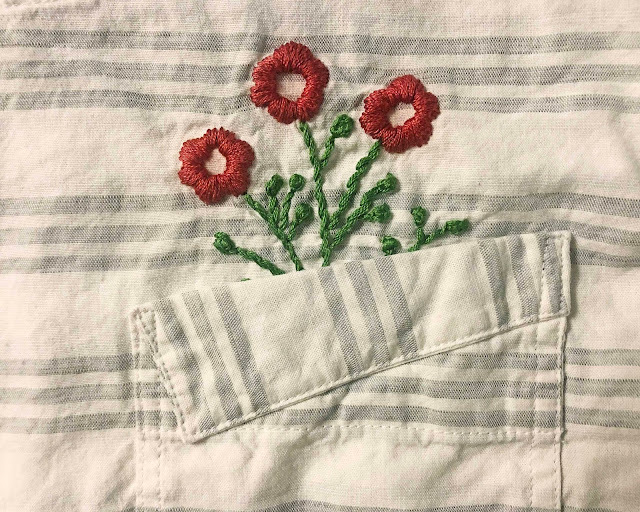 Those little flowers were by far the most time-consuming part of this shirt, but it was fun to research some new embroidery stitches. The stems have some little oyster stitch knots at the end, which was a new skill for me. That said, I'm not sure if this top is a winner for me. I've been thinking a lot about what I wear lately, and boxy woven tops aren't really making the list. Even though I've attempted to make things more interesting with some special details, I find myself reaching for my comfier knits and layering pieces a lot more. Not to mention that this shirt requires a good ironing! There have been a lot of articles written about this, and believe me I've read my fair share, but I was recently inspired to think in a new way about my wardrobe from an unlikely source - a home design blog. I've been following the Young House Love blog since their first home ages ago, and really enjoyed their recent post about paying attention to the pieces you love and wear and using that to hone in on your uniform. Again nothing new, but it was helpful to hear again. The first two tops in my work wardrobe plan have been successful because I paid attention to what I like and wear - comfy knit tops with some interesting details. 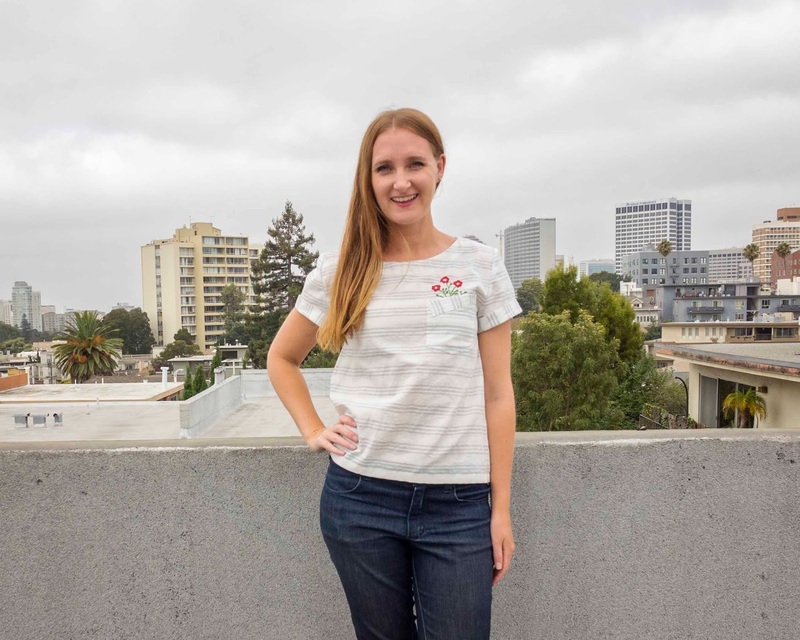 And while the third top in my plan, a white knit blouse with ruffle sleeves, also seems to fit that description, after some reflection I've decided to skip that one in favor of another Mandy Boat Tee, perhaps with an interesting sleeve hem detail. I think it will be more my style, rather than sewing up something new just to see if I like a trend. Do you have any tried and true patterns or fabrics that you reach for all the time? I've found this reflection so helpful! I love this detail! The pocket is awesome enough and then you have the cool embroidery. I have to check your blog more often! Hold up, Young House Love is posting again?! Also, if you find you never reach for this, maybe it could have a new life as a tank or cami - it seems a shame to waste your lovely embroidery!